Yes, this is a continuing theme here. Please bear with me as it becomes less. And I am thanking everyone for joining in at Free(r). Soon, I will add links to the shibori lesson videos that have been unlisted on Youtube and buried in the shibori pdf lessons 1-5. Also, have patience as the pdf’s download. Today I downloaded them as a test and some were quicker than others (some are many pages and have lots of photos). Over time, I may redo each one as they seem so primitive to me now. But a good record of Before. Thinking on that. Before, this was something else. Something useful, and before that, even something. Before will become something. (A new category even). I feel we are really in a transitional place here. I am gaining something from the momentum of it all. It was something before it was torn into strips for weaving. With my loop I can see that there are some kasuri fabrics in this piece. i wonder about its previous life. I have made a number of these over time. It started because I wanted to hold on to less. To carry less around. To feel Freer! I am making a few new ones for the show-and a new one for me. 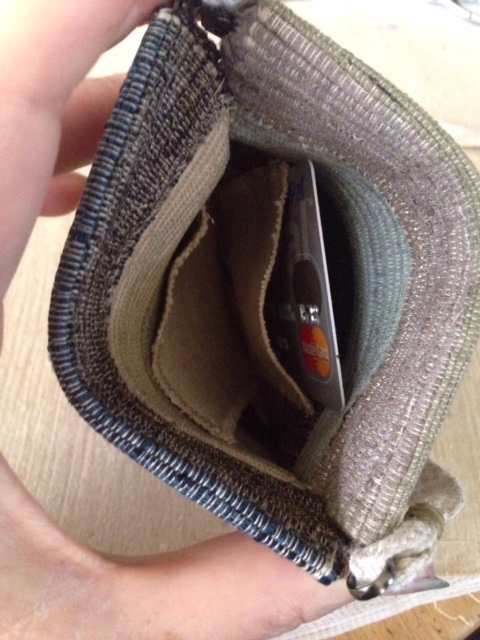 These inside pockets can hold some cards, some cash. The middle holds my phone, or not. -and now it has become something else. 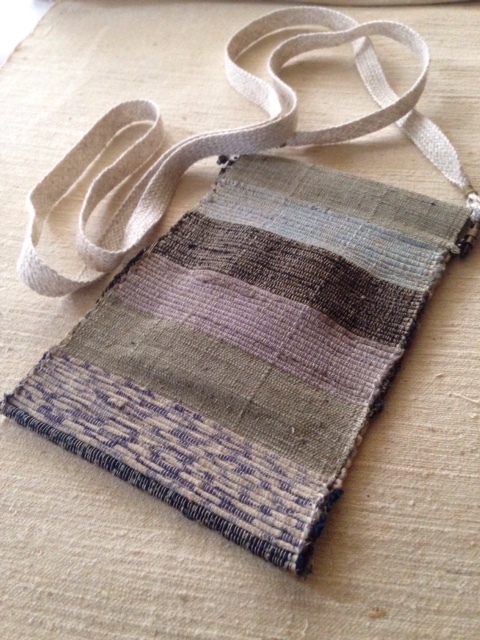 From kimono scraps, to a woven obi, to a bag to hold less. From one place (Japan) to another-here. I wonder how much time has elapsed from this cloth’s first beginnings? Something to think about. What about cloth being made today? i love the changes of cloth the weaver made as she wove. Very sturdy and beautiful at the same time. The casing I sewed at the top allowed me to slip in a spring hinge closure (purchased). I hand stitched the interior pockets (made of obishin- more on that later) so as not to see stitches from the front side. 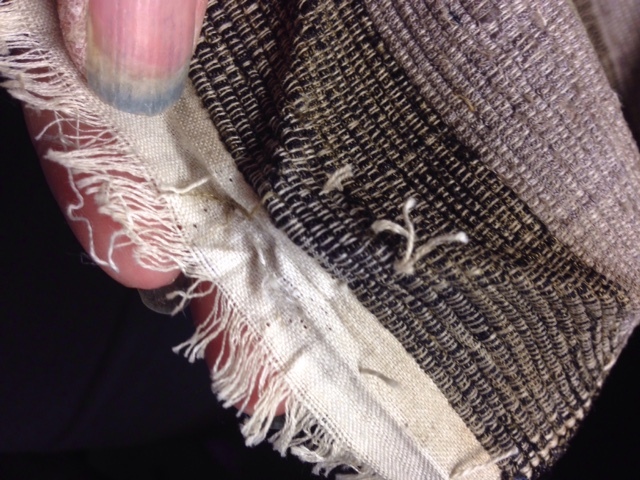 The edges too are hand stitched preserving the beauty of the weavers selvedge. One more…made of obishin-the heavy stiff cotton interior fabric of an obi…indigo dyed. This one with more machine stitching as was necessary to overcast the edges and keep them from undoing. A handmade boro stitched button closure and some hand twined indigo cording. Also has a spring hinge top closure. This one is larger than the other. Less really can become more. 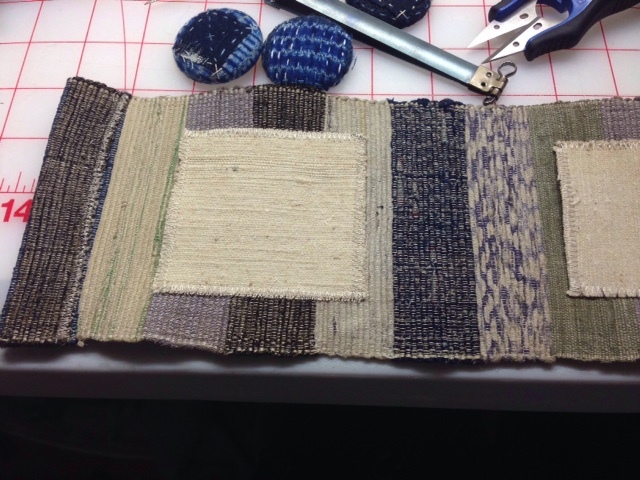 This entry was posted in Before, indigo and tagged boro, indigo, sakiori on October 14, 2015 by shiborigirl. apt comment, coming from you. me too. i like to make twine. it’s calming. if that is true, then spend many years practicing. and use your own photos when promoting your work. it’s classier. and honest. …..so gently beautiful……calming……new life for old cloth…..and so useful in its beauty….thank you for sharing. old cloth has lasting power that most new cloth does not. cloth was precious then. not something to waste. Kumo appears frequently in the ukiyo-e wood-block prints of the Edo period (1603-1868). Artisans have expanded the array of kumo techniques by varying the amount of binding used to resist the fabric, which is pulled and gathered into hornlike units. The basic binding is applied from the bottom of the unit to the top, then down to the bottom before moving on to the next unit. The result is a pattern of radiating lines against the reserved white ground. Kumo shibori can be tied by hand (te gumo) or with the help of a tool (kikai gumo). Artisans improved upon the laborious hand technique by developing a simple tool that hooks a point on a cloth and pulls it into a cone shape while a thread is mechanically wound around it. 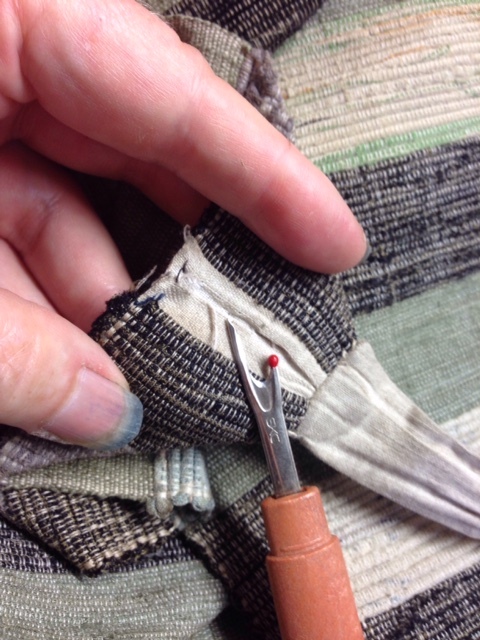 The cloth has to be hooked and held by hand, but the winding goes very fast and evenly, thus making it possible to create a small spider pattern regularly over all the cloth at a very reasonable cost. easy to COPY isn’t it? LESS as a theme prevails throughout 2015 as I clear my space to do more Shibori — admire your process of turning a beautiful piece into something new. yes, let’s do more shibori!